Diagnosed with fibromyalgia in her mid-thirties, Nancy Laracy adopts a rabbit, Bunny Boy, who ends up saving her life—literally. When the rug is pulled under from Nancy Laracy, a busy wife and mother of two who is diagnosed with a mixed connective tissue disease and fibromyalgia in her mid-thirties, she rebelliously adopts a baby red satin rabbit, Bunny Boy. So begins a deep, magical, and lifelong bond, where Bunny Boy and Nancy become inseparable companions in pain management. As Nancy battles her debilitating chronic pain, Bunny Boy is diagnosed with a similar incurable autoimmune disease, developing a severe jaw abscess. Despite the fact that bunnies are known for succumbing to their fear and pain during medical treatment, Bunny Boy fights through countless surgeries with the heart of a lion, even helping to pioneer a cutting-edge medical treatment that, once made available to humans, would save Nancy’s life. Despite Bunny Boy’s illness, he lives boldly with joie de vivre without a care for his pain, gamboling about the house where he runs free. As they grow closer in sickness and in health, Bunny Boy shows Nancy how to reclaim her own zest for life and overcome her disease, as well as dozens of other patients in a rehabilitation center when he becomes a therapy rabbit. A poignant story of resiliency, deep love, and faith in miracles, Bunny Boy and Me is a heartwarming tale of the unluckiest, luckiest rabbit who defied the odds and made a difference. Nancy Laracy is a writer, activist, wife, and mom who suffers from autoimmune disease and fibromyalgia. Since being diagnosed in 1997, she is a worldwide advocate and resource for the chronic pain and pet therapy community, serving on organizations such as Animal Assisted Therapy, CancerCare, and the National Fibromyalgia and Chronic Pain Association, among many others. Nancy lives in Franklin Lakes, New Jersey. "Nancy Laracy is a gifted writer, who tells a difficult story with great sensitivity and depth. By the end of the book, I loved and appreciated Bunny Boy just as much as she and her family did. A moving and ultimately uplifting book." "Once in a great while, a book falls into your hands that touches your heart. Bunny Boy and Me is such a book. Written with heartwarming authenticity, Bunny Boy and Me is a triumphant example of how love, even from an unexpected source, can bond two souls and see them through an unforgettable journey." "This poignant story of Nancy and her 'third child' captivated me. . . . I found myself both laughing at Bunny Boy's antics and crying with the physical struggles both he and Nancy had to deal with. . . . The love given to this remarkable bunny by Nancy and her entire family, and the love returned, is palpable. . . . I would recommend this book to anyone struggling with chronic pain or debilitating illness. It is truly a story of love, strength, resilience, and hope; and how love for a pet can be a powerful tool in overcoming challenges in coping with illness." "This eloquently written, heartwarming memoir by Nancy Laracy is an example of the power of love to heal where modern medicine falters. It will bring light, joy, and inspiration to all those who read it. Bunny Boy was a fighter, a teacher, and ultimately a healer. I believe it was Bunny Boy’s healing power that led Nancy to start the first branch of Bunnies in Baskets on the east coast, which brought her and her second bunny, Muffin, to our grief-stricken families in Sandy Hook, Newtown, Connecticut, where, just weeks after the events of December 14, 2012, and for the last five years, even with so many health issues of her own, Nancy and her miraculous rabbit brought love, comfort, and cheer to so many of our children who experienced a tragedy impossible to imagine." "A thought-provoking memoir that reminds us to be resilient!" —Milly Velez, president and founder of the Fibromyalgia Care Society of America, Inc.
"Nancy Laracy's memoir is a deeply moving testament of how one small animal can play an important role in many people’s lives. Aside from Bunny Boy's designated therapeutic role, he was so valued as a companion, and as a rabbit, which certainly affected the quality of Nancy's life. Nancy helps us experience this bond, connecting us through smiles and tears, so much so that we are left understanding more to help others." "Virtually all pain can be effectively treated. The problem lies not with effective options, but rather physician education. Sometimes, when the doctors don't know, our pets do! 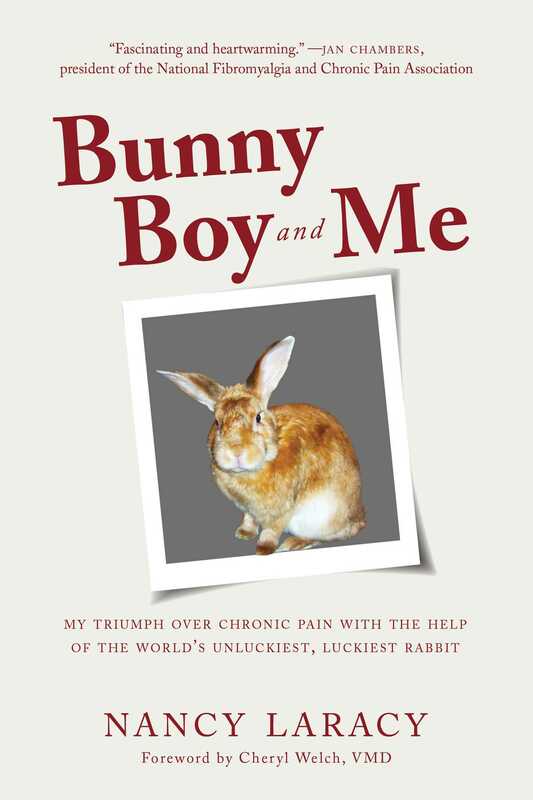 The touching story of Bunny Boy and Me can give you hope!" "I was so touched by Bunny Boy and Me. I knew Bunny Boy in real life and experienced fist-hand how the children with life-limiting diagnoses responded to him with such joy. You will learn the beauty of our celebrity bunny and the meaning he brought to those who were affected with chronic illness. It is a must read!" "Bunny Boy had me wrapped around his paw from the beginning of this truly amazing story of the bond formed between a house bunny and a human. I laughed. I cried. I binkied. Bunny Boy and Me is a remarkable example of how unconditional love can heal. It is a must-read for all pet lovers and those seeking inspiration."